I was sent details of our lovely hosts by email in the days leading up to our dinner party experience and through the EatWith website, could see details of other guests attending too. Me and hubby would be joining people from America and China for dinner, with our hosts Jo and her husband feeding us a veritable Tuscan feast. Our main host was Jo, who usually hosts with her friend Momi, but on our evening, her lovely husband stepped-in as Momi was away. Jo sent us directions to their farmhouse in the Tuscan hills, as it really was a hidden treat and would have been tricky to find with the Sat Nav alone. We also had her number should we get lost, which we obviously didn’t, as her directions were so thorough! It was the perfect Tuscan evening, not too hot, a slight breeze in the air and clear skies to reveal the most impressive views from our host’s home. It genuinely was breath-taking! On arrival, we were welcomed, given a tour of the property and the number of stunning views and encouraged to enjoy an Aperitivo of local white wine and stuffed peppers. We met our fellow diners and instantly started chatting and both the hubby and I were relieved to find that they were all so lovely and sociable and we enjoyed sharing stories and opinions from all over the world. (I learnt a lot about US and Chinese politics!). Next, Jo and her husband led us over to our al fresco dining spot, which was the most BEAUTIFUL table set-up I’d ever seen. I mean, if it was a wedding, you wouldn’t be disappointed! It was perfectly Tuscan, dreamy and romantic, with lanterns hanging above the table and foliage and candles adorning the table top. Simply bellissima. I was happy to see, that as the best Italian meals start, we were served a delicious pasta dish. 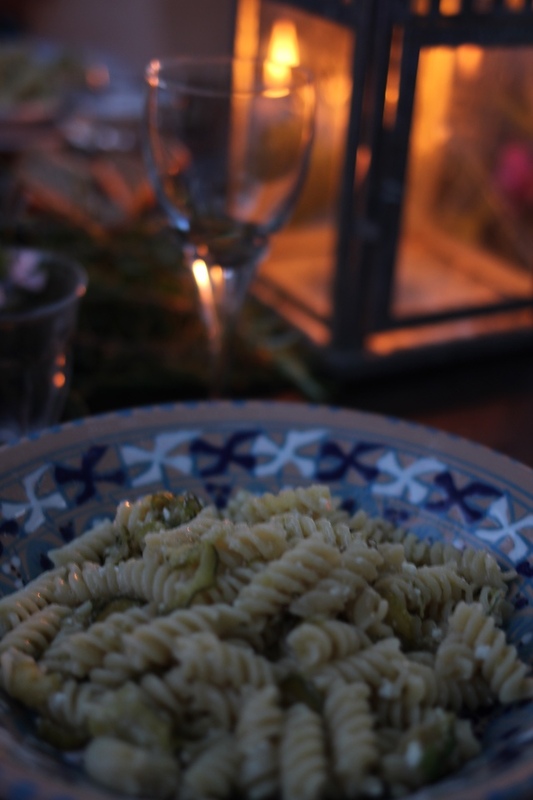 This was fusilli with courgette (or zucchini) and ricotta. Jo’s husband brought the two large bowls of steaming pasta to the table and finished it with a small glass of the cooking liquor, which he explained is the best way to keep the pasta moist and perfect to eat. This is a tip I’m definitely taking back home to my kitchen! I happily accepted seconds (and was too polite to accept thirds, although I would have eaten the whole bowl if I could!) and enjoyed with good conversation and local white wine. Next in our feast was Parmigiana – a stack of aubergine (or eggplant), homemade tomato sauce (which genuinely was one of the most delicious things I’ve eaten!) and Pecorino cheese (which was from a local sheep farm). This was served with a simple salad and was just delicious – again, I happily accepted seconds! Jo and her husband were proud to tell us about why they lived in the hills surrounding Florence and had chosen a lifestyle where they grew their own food or sourced it locally and organically. They talked about their chickens (who would wonder happily in and out of the farmhouse) and what food meant to them. The dessert was the most unusual course and introduced some new flavour combinations to me. It was stewed plums and fruits with homemade lavender ice-cream. The lavender really came through and was balanced perfectly with the fruit and made for an ideal, cooling and light dessert to complete our Tuscan dinner. And as with the best Italian meals, we finished with a glass of Vin Santo (one of my favourite things!) and chatted into the night. Jo and her husband really were the perfect hosts and welcomed us into their home. It was such a privelege to experience their breath-taking farmhouse and be cooked for and if you’re a foodie like us, there’s nothing quite like it! Thanks to EatWith for inviting us and we can’t wait to discover more local chefs in more cities as we travel around. And who knows, maybe we’ll even host one ourselves in Manchester one day! Use code ‘Holly10’ when booking to receive $10 ( or the equivalent in Euros) off. This offer is only valid for first-time EatWith users and is valid until October! If you book, please let me know and tag me in your insta-stories, so I can join you in your amazing dining experience. 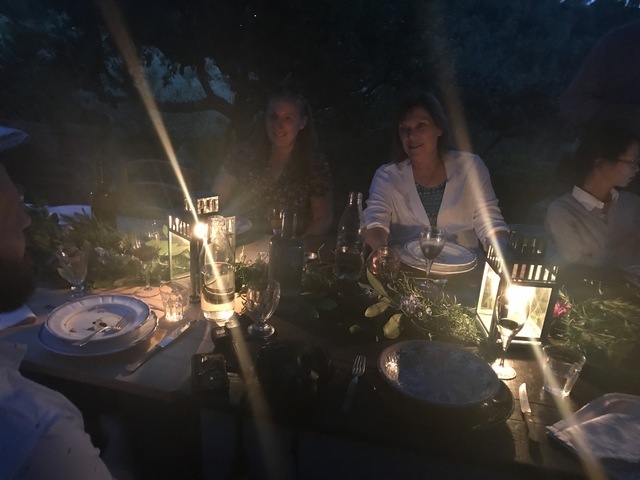 And if you head to Tuscany anytime soon, I definitely recommend you attend one of Jo and Momi’s dinner evenings, as you really won’t have experienced anything quite like it. A vlog post is coming soon on my Youtube Channel so keep your eyes peeled.